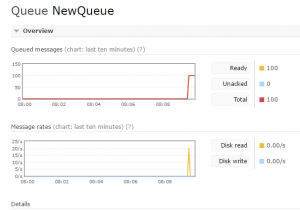 A queue in a message broker can be persistent, which means that, should you have a power failure (or just shut down the server), when it comes back, the queue is still there. Admittedly, that doesn’t sound very durable! The reason for this, is that the durability of the queue doesn’t affect the durability of the message. At least, if the queue is durable, it doesn’t make the message so. How can it be made persistent? As you can see, the messages are still there, and you can see the time difference where they’re been restored to the queue after a failure. I suppose the main question here is what price do you pay for durability. This gives me a chance to play with a new tool that I heard about a little while ago: BenchmarkDotNet. So, it is a bit slower to persist the message. I’m not sure how helpful this information is: I probably could have guessed that persisting the message would have been slower beforehand. 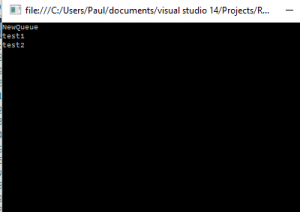 Having said that, I am quite impressed with BenchMarkDotNet! 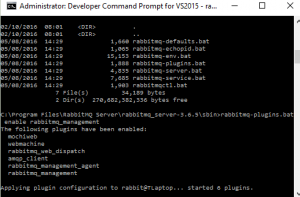 This entry was posted in C#, RabbitMQ and tagged BasicPublish, Benchmark, BenchMarkDotNet, BenchmarkRunner, ConnectionFactory, Durable, IBasicProperties, Message, Message Queue on November 4, 2016 by pcmichaels. 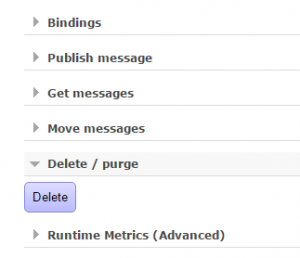 Conceptually, message queues work in a similar fashion: you send a message to an exchange, the exchange allows people to read the message, and you have functionality that ensures the original message arrives with the destined recipient. Acknowledgement of a message is basically a way to ensure that delivery. Having said that, the two main message brokers that I’ve been investigating deal with this in a slightly different manner (albeit, the same things happen in the end). If you want to follow through, it might be an idea to use the code from my first post as a starting point. Now we have 100 messages. BasicConsume() has a parameter called “noAck”. It took me a while to work this out, but noAck means that it doesn’t expect an acknowledgement; that is, it will automatically acknowledge receipt. So, noAck = True mean automatically acknowledge, and noAck = False means manually acknowledge. That not entirely uncomplicated. I’ve left the error and the commented out BasicAck in on purpose. If you run this, unlike with ActiveMQ, where you will get a message at a time, you will get all messages in the queue (because it’s event based). 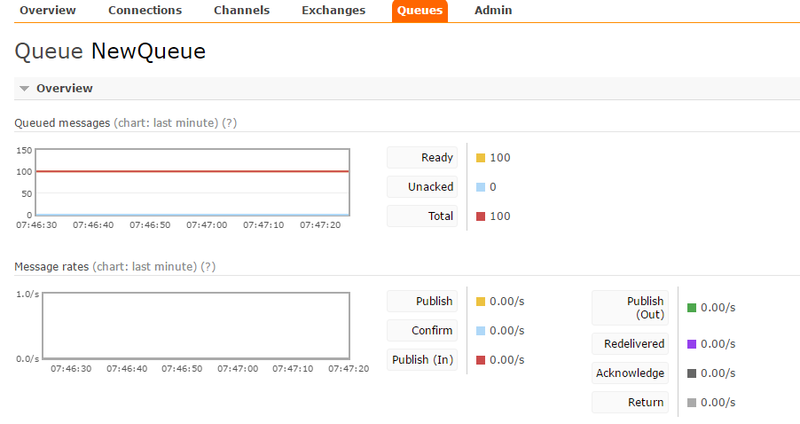 Add in the BasicAck() to acknowledge the queue and you’re good to go. If you add in the error at this stage, you can see that, in exactly the same way as ActiveMQ, it will only acknowledge the correct message. What you will also see here is we have the poison message scenario that I discussed in this post on ActiveMQ. So, we have a problem, and we issue a Nack. 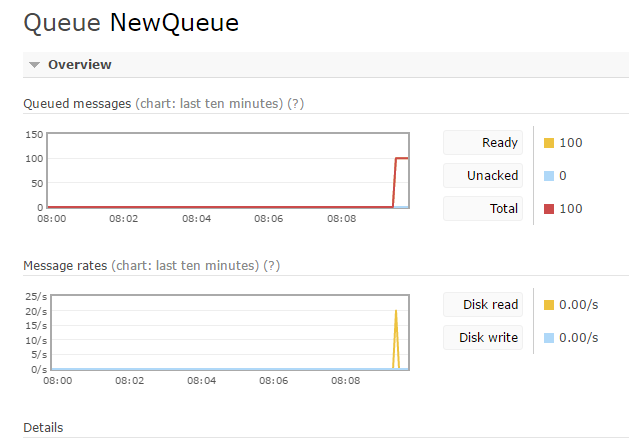 What the Nack does is allow you to re-queue the message. The code above allows the queue to process, but just moves all the bad ones to the back. The obvious problem here is that it the problem isn’t transient, we’ll keep coming back to them. It does, however, get around the problem – the queue is no longer blocked. There’s effectively two steps. Firstly we need a dead letter exchange, and this needs a routing key (in this case, “dead-letter”). 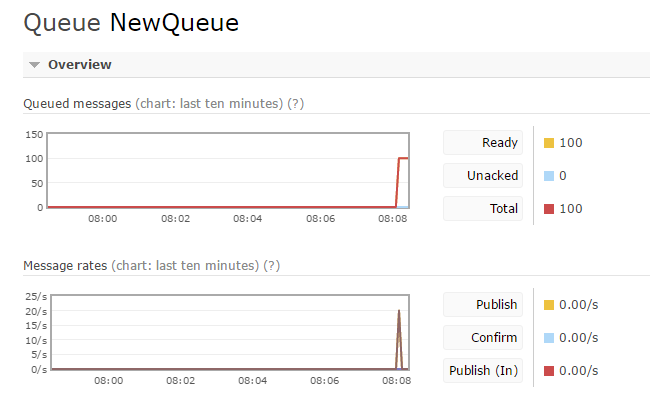 Next, we declare the DeadLetterQueue with the same routing key. 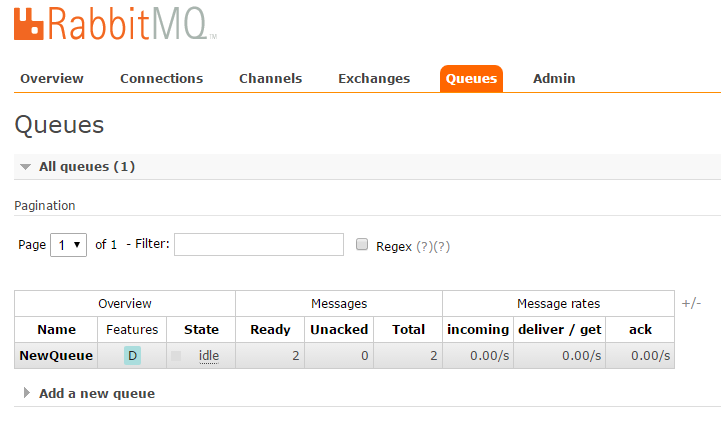 Finally, return the argument list, which allows the linking of the main queue to the dead letter queue. 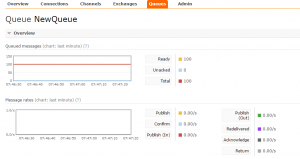 If you start getting errors when you run this, try referring to this article. 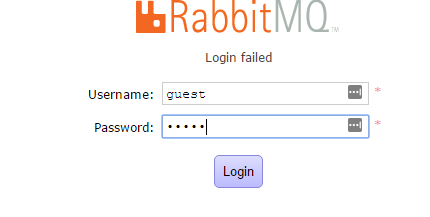 This entry was posted in C#, Message Queue, RabbitMQ and tagged BasicAck, BasicDeliverEventArgs, Consumer_Received on October 28, 2016 by pcmichaels. So, the problem is that the exchange is changing. This didn’t feel right, so I asked, and it turns out you can’t do this in code. Also, remember that both the publisher and subscriber need to change the code, otherwise, the publisher will re-declare the queue without the exchange. 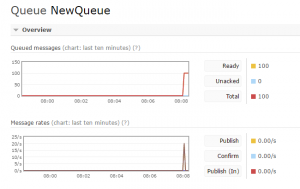 Not that this happened to me – I realised that straight away, and didn’t spend an hour trying to work out why even deleting the queue didn’t work. 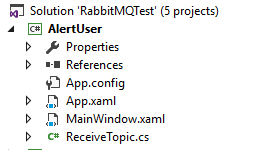 This entry was posted in C#, RabbitMQ and tagged Dead Letter, inequivalent arg, OperationInterruptedException, PRECONDITION_FAILED, RabbitMQ.Client.dll, The AMQP operation was interrupted on October 20, 2016 by pcmichaels. Following this year’s trip to DDD North I got speaking to someone about Rabbit MQ. I’d previously done some research on Active MQ, however, given that there are, realistically, only two options in this market, I thought I should have a look at the competition. You also need to install Erlang. 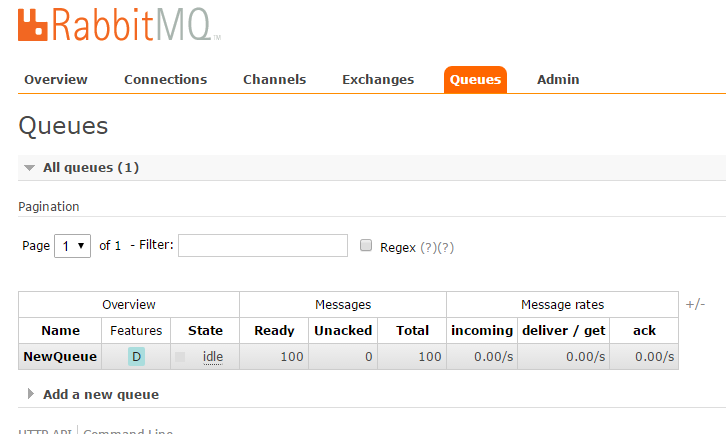 Rabbit will now run as a service, which also feels much cleaner that ActiveMQs console app style interface. Doesn’t work because exclusive defaults to ‘true’, meaning that only your session can see it. Why the Thread.Sleep? The reason is that, because the message consumer is event based, you need to stop tidying up the objects until you’re done. Obviously, sleeping for 1 second has its issues. I suspect this could be better achieved using a TaskCompletionSource, of even just a Console.ReadLine(), but for the purposes of this post, it suffices. The concept of topics seems to be the same as ActiveMQ; however, the implementation is different, and there were a few dead-ends to go down first. The “test” is a routing code. These seem to be quite an involved system; however, it basically tells the exchange where the message is going. Notice the routing key; this (broadly speaking) needs to match the sender’s routing key. The purpose seems to be to allow a complex mapping between publisher and subscriber. 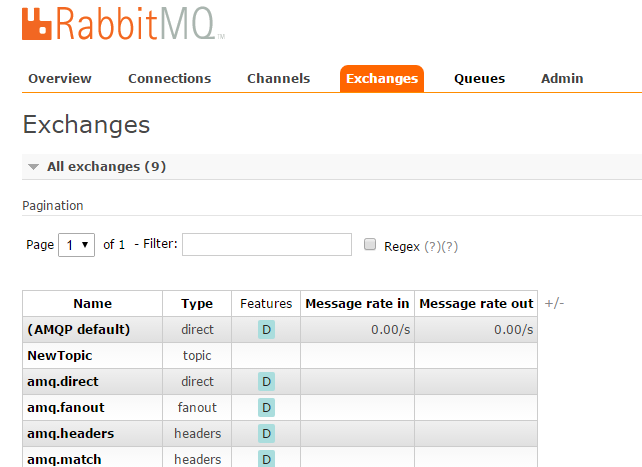 In comparison to ActiveMQ, RabbitMQ seems to be a more actively maintained code base; a quick comparison of the GitHub repo of each reveals more activity in Rabbit. Rabbit also seems a little cleaner in the way it’s run and installed; however, it also seems to have more moving parts. 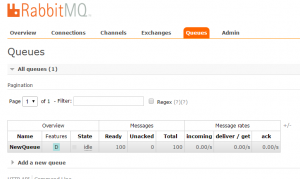 There are a number of companies that offer support for ActiveMQ commercially; however, the company that wrote RabbitMQ offer commercial support, should you need it. 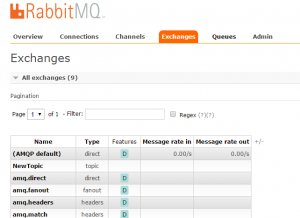 Can you run Active and RabbitMQ together? No. No, you can’t. They both seem to want to use the same resources, and so if you want to use them both on the same machine, you can, but only one at a time. This entry was posted in C#, Message Queue, RabbitMQ and tagged 4.5.1, BasicConsume, BasicPublish, c#, EventingBasicConsumer, ExchangeDeclare, Install, RabbitMQ, Start, Tutorial on October 7, 2016 by pcmichaels. This was one of the features that interested me most in message queues. Basically, you have an application, and you want to communicate to it; that is, Joe Bloggs the user is sat there, tapping away at his keyboard, and I want to send him a message that interrupts him. There are dozens of use cases for this: the user has entered an order and there’s a problem with it, the user’s account has been locked and needs to be logged out, we want to alert them that there’s a data change so that they can refresh their data. The relevant part of message queuing here is a topic; which allows me to send an alert to one of more listeners. This, effectively, allows me to provide custom functionality on the receive. If you find that you’re using this to pass in the same one-liner, you could adapt this to simply pass in an action. This entry was posted in C#, RabbitMQ and tagged alert, BasicConsume, c#, ConnectionFactory, EventingBasicConsumer, ExchangeDeclare, IConnection, IModel, QueueBind, QueueDeclare, RabbitMQ, topic on October 4, 2016 by pcmichaels. Adventures in C#8 – The annotation for nullable reference types should only be used in code within a ‘#nullable’ context.